I’m interested in Flying, what does it take to become a Pilot? There are a number of factors to consider when beginning the process of gaining a Pilot’s Licence. Firstly, the type of Licence you will ultimately gain will depend on the type of flying you wish to undertake. Most people start out by gaining a Recreational Pilot Licence (RPL), which allows them to fly during daylight hours, within 25nm of Redcliffe with passengers on board. On average, Students will gain around 35-45 hours of flying experience by the time they earn a Recreational Pilot Licence, and the time taken to complete this could vary from 8 weeks (full time training) to 10 months (1 lesson per week). After the RPL is gained, the option of Private or Commercial Licences are available – flying anywhere in Australia, or flying as a job. A PPL holder will have between 70-80 hours of flying experience when they receive their licence, and a CPL holder 150-200 hours. The academic requirements of a Pilot’s training course are within reach of the average person. High school study in mathematics and English can help, but a keen interest in learning both the theory and practice of flight is often all that is needed. The ideal first step is to take a Trial Instructional Flight with one of our Instructors. This will give you an opportunity to see how flying feels, have a chat about your goals and ask any questions you might have. I‘m hooked on flying! I’d like to start a Training Course, what do I do now? Apply for an ASIC – After getting a letter from us stating your need for an Aviation Security ID, you can apply for an ASIC. This is a prerequisite to solo flying. It does take time to organise the above listed applications, but that’s okay. You only need to have them completed by the day we send you on your first Solo Flight – generally after 12-18 hours of flying training. Getting a head start on the theory by purchasing the Student Pilot Kit straight away is always a good idea. If you have questions regarding these processes, just drop into the Club or give us a call. In which aircraft can I learn to fly? The Cessna 172 is the bread and butter of our fleet. They are cost-effective and highly versatile aircraft, capable of taking your through to the PPL Licence and Night Rating. If your goal is to gain a Commercial Licence the Cessna 172 will prepare you to fly the more complex Cessna 182, 206 and 210 later in your training. How am I billed for each lesson? Generally you will be billed for the flying time you conduct during a lesson, measured on the aircraft’s VDO meter to the nearest 1/10th of an hour. Other costs may include Instructor briefing time before your flight, airport landing fees (NOT at Redcliffe, but other aerodromes during navigation training) or exam testing fees. These costs are outlined in detail on our “Course Summary Sheets” over on the training page. I‘d like to Private hire a Club aircraft, but haven’t flown with RAC before. Where do I start? 1 – Become a Member of the Club. 2 – Complete a satisfactory check flight with one of our Instructors on the type of aircraft you wish to hire. Depending on previous experience and recency, this could be just a few circuits, or also some exercises in the training area (stalls, steep turns etc). The aircraft rates page also offers details the minimum experience required for Hire of complex aircraft in our fleet. A NVFR or IFR check may be required to exercise such privileges on your licence. 3 – Your now able to Private Hire a Club aircraft. What a lovely kitchen you have, can I use it? Please feel free to use the kitchen facilities as long as you help us keep it clean. There is a fridge, microwave, kettle, cafe-press/grill and toaster. Members and guests may help themselves to tea and coffee. What refreshments do you generally offer? Our bar is usually stocked with a range of soft-drinks as well as bottled water, ginger beer, beer, spirit/Cola Mixes etc. We also have chips and chocolates available for sale. I’ve made a booking that I can no longer keep, what do I do now? Just give us a call as soon as practical to either cancel or reschedule your booking. Please aware that RAC charges a ‘late cancellation’ fee if your Dual Training Lesson (with Instructor) is cancelled within 48 hours of the start time. This attempts to recover some of the lost revenue due to an Instructor now with an empty period during the day. What does it cost to become a Member of the Redcliffe Aero Club? Click here to visit the Membership page for current fees and other information. What options do you offer for payment of my aircraft Hire or training? Payment options include: EFTPOS, VISA, MASTERCARD, CASH, CHEQUE, BANK TRANSFER (prior to flight) – we do not currently accept AMEX. You account needs to be settled at the end of your hire period or flight, as we do not offer a credit facility. Some Members choose to leave a pre-paid positive balance on their account and simply draw from it as they hire, the choice is yours. For aircraft hire that takes place outside our office hours, we ask that you simply give us a call when we’re next open to arrange payment. I need a headset and maybe a life jacket, can you help? RAC offers Students FREE access to basic pilot headsets. Members conducting private hire may rent headsets for a small charge. This small charge covers the cost of maintenance and replacement. Life jackets should be taken on all over water flights as a safety precaution and are required on some flights (Moreton Island). Our Life jackets are regularly serviced and can be hired for a small fee. What is a ‘Wet’ Hire Rate, and what do I do if I need to refuel during my hire? With each aircraft, RAC offers a BP fuel card to use at BP bowsers across the country. If you use the card, there is no more to pay (ie: you’re hiring the aircraft ‘wet’, no extra cost for fuel). However, if you visit an aerodrome without a BP bowser, you can organise payment by another means such as personal credit card and be reimbursed by RAC at the completion of your hire. The reimbursement value is based on the local Redcliffe Aerodrome BP fuel cost on the day. This can mean a few cents per litre discrepancy out of pocket when filling up at more expensive regional locations without BP bowsers. Please be absolutely sure that you retain receipts of fuel purchased (not using BP card), as reimbursement is not possible without them. What are the club-specific rules regarding hire of aircraft? RAC requires that pilots have flown with the club in the past 90 days in order to conduct a private hire. A recency check if needed, is a quick dual flight check only. Please ask for assistance if your aircraft is located inside the Hangar (Excl: FRF, TRE, PKA, ELS). An instructor will help you safely manoeuvre the aircraft into the open. Unless another member is hiring immediately after you, please return FRF, TRE, PKA, ELS to their Hangars on completion of your hire. Please return the aircraft with sufficient fuel for a 1 hour flight. This amount includes reserves and is approximately 75L for a C172. Before filling the tanks completely, please check with the office that the next booking is not weight-limited (unable to carry full fuel). Please use a Redcliffe Aero Club allocated Parking Space. Can I hire an aircraft after hours - say, for night or early morning flights? Yes – Just give the office a call beforehand and ensure that the aircraft and keys are positioned for your after-hours access. Payment of your hire can be completed via phone during the next RAC opening hours. I’d like to conduct an extended hire of an aircraft for an upcoming trip, do you offer multi-day hires? Yes – RAC is happy to hire aircraft to members 24hrs, 7 days a week and for multi-day bookings. Because some aircraft are heavily utilised and kept busy by our students in training, we may ask that members conducting multi-day hires conduct a minimum amount of flying each day. Please chat with an Instructor to determine this minimum, as it varies depending on aircraft demand. For search and rescue (SAR-Time) purposes, we require members conducting multi-day hires to leave a detailed itinerary at the club before departure. We are open 7 days a week, from 8am to 5pm each day. We are closed on Christmas Day and Good Friday only. Instructors are also easily available for early (6am) starts and late finishes with arrangements made prior. You can private hire an aircraft from us any time! I’d like to purchase a flight as a Gift for someone special, what can you offer? The experience of flight, whether a scenic, adventure or Trial Instructional Flight lesson, is something that will be remembered for years to come. You might be offering that little nudge to help someone pursue a passion for flying through the gift of a Trial Instructional Flight, or giving the simple thrill of taking the controls and actually flying an aircraft. Whatever the reason, we’re happy to offer Gift Certificates for a range of experiences that will be remembered! We can immediately set up a flight time, or leave it open for the recipient to call us and make arrangements later. Give us a call on (61 7) 3203 1777 to inquire or purchase a voucher today. I have an RA-AUS Licence, and would now like to upgrade to a PPL or CPL, where do I start? Redcliffe Aero Club offers conversion courses that are individually tailored to get you on track and moving towards your intended licence. Your previous flying experience can often count towards your PPL or CPL experience minimums. Please contact us for further information. Converting to an Australian licence, or gaining permission to fly within Australian territories is a process that begins with contacting the Civil Aviation Safety Authority (CASA) ‘CLARC’ Department. Click here for CASA CLARC and begin the conversion process. Once you’ve obtained the appropriate licence or approval through CASA, become a member of our club, and conducted a flight review, you can private hire club aircraft. Where can I find out about the happenings of the Club? 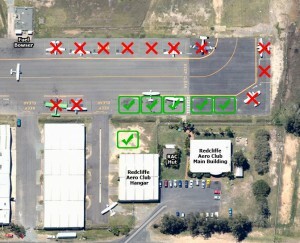 How does the Redcliffe Aero Club conduct it’s business / operations? The Redcliffe Aero Club is listed as a Not-For-Profit Entity under the Income Tax Act. As such, all RAC profits are used to maintain and update it’s facilities and assets. A not-for-profit entity which ensures the overall benefits accruing to the Club are utilised for and in the best interests of the membership and the community. Given the large size of our operation, the organisation follows best practice management in that the Board appointed, full time Chief Executive Officer runs the aviation and business side of the organisation, and is a key adviser to the Board on the social and community side. The Board sets the annual objectives for the organisation including the financial and other delegations of the CEO. At each monthly board meeting a review is conducted of the financial and other objectives as reported by the CEO. Once each year (usually in November) the organisation hold’s an Annual General Meeting (AGM). Notification of this AGM is provided by a posted written letter to each financial Member at that time and propagated on our website in compliance with ASIC requirements. Minutes of monthly board meetings are not available as speculative discussions about current and future commercial issues are often discussed in confidence. Similarly the organisation- Business Plan, Capital Plans, Human Resource Management Plan, Remuneration Policy, Business Management Manual have been developed, but are not publicly available due to their commercial in confidence nature. At the AGM both the President and Treasurer present their own reports on the previous year’s operations, as well as the audited Annual Financial reports. The meeting is open to questions from the attending Members. Members are of course also most welcome to discuss ideas and questions at any time with the CEO or baord personnel. Member input is often encouraged through the website and the organisation’s Airchat magazine, particularly on core issues. Member input is always welcome / encouraged and is most easily directed via email.